Sheep tell many tales as they graze. There’s little to do in a grassy field but count the clouds, search for four-leafed clovers, and tell tall tales. Yet, some of the sheep’s tales are true, and when Soft-as-Snow stares at the clouds with her liquid brown eyes, she isn’t counting them. She’s searching, seeking, and hoping against hope — waiting for White Wings to return to her. Soft-as-Snow is an old sheep now, and she spends her days watching the sky and waiting. But she isn’t sad. She knows that White Wings will return and fill the sky with the fluffy span of her cirrostratus wings. When Soft-as-Snow was a young sheep, she watched and waited too — she watched the other ewes birth and raise lambs every spring; she waited through every winter, wondering why her body didn’t grow thick like the other ewes. She frolicked with the rams as much as any of them; she was healthy and ate well; but she bore no lambs. Other ewes swore she was blessed. Yet her heart filled with sadness. One spring, Soft-as-Snow could stand watching the other ewes with their new lambs, hassled but happy, no longer. She waited until Sharp Eyes, the barker who guarded the sheep herd, was distracted by a lamb gamboling too close to the creek. Then she sneaked away from the meadow, and disappeared into the shadows of the alder tree woods. Soft-as-Snow wandered among the ferns and foxgloves, peaceful but still sad. She sang the song that she had always longed to sing to a lamb of her own, bleating the words with such sorrow and longing that a tiny presence was moved by her emotion. “Do not cry, Mother Sheep,” chimed a tiny voice. Gold light dappled the undergrowth between the shadows. A gust of air rustled the leaves far above, and all the shadows moved. One of the gold dapples — at the tip of a fern frond — tilted, folded, and then flapped from the fiddlehead to the tip of Soft-as-Snow’s black, wet nose. With his gold wings and delicate legs, the butterfly perched between Soft-as-Snow’s eyes was the most beautiful thing she’d ever seen. “For a price,” the butterfly added in his tinkling voice. “Done.” Soft-as-Snow ripped a hank of her wool out with her own teeth, and the butterfly grasped it with his six legs. He flew the ball of wool up into the trees, promising to return with everything Soft-as-Snow would need to bear a lamb of her own. The butterfly took so long that Soft-as-Snow began to wonder if she had dreamed it all — dazzled, hypnotized by the dancing, dappled light of the wood. Then a spot of gold in the sky flapped toward her and the butterfly returned. He held a tiny, minuscule globe in one clawed hand — gold as his wings, luminescent, and small as a poppy seed. The butterfly landed behind Soft-as-Snow’s ear and planted the tiny globe deep in her thick, white wool. So Soft-as-Snow returned to the meadow with a secret. Sharp Eyes barked at her but was clearly relieved that he was no longer missing a sheep. That night, Soft-as-Snow whisper-sang her lullaby to the tiny globe nestled in the wool behind her ear. As the days passed, Soft-as-Snow began to feel foolish; her body was not growing thick; had she given the butterfly a piece of her wool for nothing? It was a small price to pay, even for nothing… But she felt her heart would break permanently if she didn’t bear a lamb of her own this time. Yet while she worried, a bump grew behind her ear as if her wool were developing a terrible mat. The bump grew to a lump the size of an acorn; then a chestnut; then one morning, when the meadow was fresh with dew and Soft-as-Snow had stayed up all night whisper-singing, she felt a pulling sensation in the lump of wool behind her ear. She roused herself and rambled over to the stream where she could see herself in the water’s reflection. Tiny black hooves — as small as the butterfly’s claws — broke through the matted wool behind her ear. Two hooves, then two more, then a third pair. Soft-as-Snow’s lamb was no larger than a butterfly; its body was woolly but segmented; curling antenna sprouted from its head; and snow white wings unfurled from its back. It wasn’t quite sheep, nor quite butterfly. “I’ll call you White Wings,” Soft-as-Snow cooed to her newborn sheeperfly, and she was profoundly happy. Through the summer, Soft-as-Snow and her miniature lamb grazed the meadow together. White Wings fluttered from one blade of grass to the next, always staying safely hidden in the shadow cast by her wooly white mother. Soft-as-Snow sang to her lambkin and told her all the tales that sheep tell. All except this one, for she didn’t know it yet. She and White Wings weren’t done living it. When autumn came, the air grew chill, and White Wings shivered. Soft-as-Snow pulled out hanks of her own wool to give the tiny lamb, much as she had given to the lamb’s fairy father. White Wings wrapped herself in the wool like a coat, growing fatter and fuzzier, until one day she could no longer fly by her mother’s side. 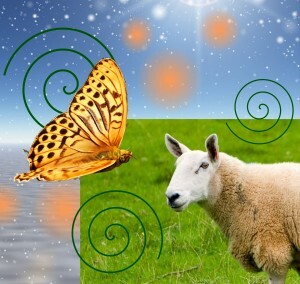 Butterflies don’t live as long as sheep, and Soft-as-Snow feared her tiny daughter would die. So she sang White Wings lullabies filled with sadness and fear, hope and protection, woven through and through with love. Yet the ball of wool encasing her daughter grew cold, and Soft-as-Snow nearly gave up hope. Then gold dappled the sky. It was White Wings’ fairy father, summoned by the pain in Soft-as-Snow’s voice yet again. “I cannot bear to hear you sing this way,” he chimed to her. Soft-as-Snow guarded her daughter’s cocoon through the rest of the autumn, and true to the golden butterfly’s word, when the first flake of snow landed on her nose that winter, White Wings’ cocoon began to tremble. The second flake landed on the wooly cocoon like a frozen kiss, and the ball of wool grew light. It puffed and swirled and stretched and expanded around Soft-as-Snow like a fog or an embrace. Like a memory. Like a hope. Like her daughter — everything that White Wings was to her, deep inside Soft-as-Snow’s heart. The fog lifted, drifting upward, condensing, dancing with the falling snowflakes, until White Wings was the most beautiful butterfly-shaped cloud in the sky. Her body was a puff of cumulonimbus; her wings stretched out cirrostratus. She snowed down kisses in the form of snowflakes to her beloved mother and promised that, though she would wander and graze the sky, she would come back to bathe her mother in loving raindrops every summer when the days were at their hottest. Soft-as-Snow watched her daughter float away into the winter sky, safe in her shadow and complete in her love. When other ewes bear new lambs, spring after spring, Soft-as-Snow tells them the tale of her darling sheeperfly. The lambs laugh and call her crazy, but every summer — when the days are at their hottest — the whole herd comes to stand beside Soft-as-Snow in the cooling kiss-like raindrops that fall from the sky.